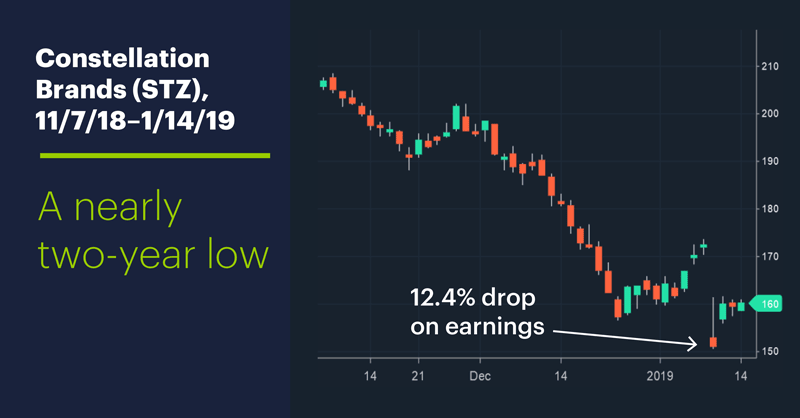 A 12% drop after releasing quarterly numbers is no corporation’s idea of good day—especially when a company beats both earnings and revenue estimates—but that was the headache global liquor powerhouse Constellation Brands (STZ) found itself with last Wednesday. The company also said it hasn’t yet reaped dividends from its $4 billion investment in Canadian cannabis firm Canopy Growth (CGC)—one of the deals that arguably helped spark the surge in the legal marijuana space last year. But in the first 24 hours after the earnings announcement STZ received some notable analyst upgrades (albeit some with lowered long-term price targets), including one from Goldman Sachs that argued the sell-off was overdone, and that the stock had significant upside without any input whatsoever from its CGC investment.2 STZ shares bounced back around 6% on January 10, and yesterday were trading around $150–$160. While it’s certainly possible that STZ will test that January 9 low (some potential buyers may be looking forward to such a move), bullish traders may be eyeing the recent drop as an opportunity to scoop up shares at an advantageous level—especially options traders, since STZ implied volatility (IV) has dropped sharply since the earnings release. Because high IV typically results in more expensive options and low IV in cheaper options, STZ options could be trading at relatively cheap levels (call options may also get an additional discount in the event of a near-term pullback in the stock price). 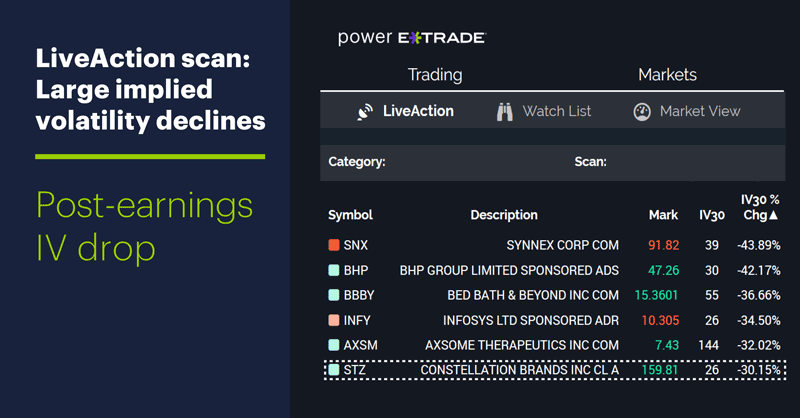 As a result, some traders interested in taking advantage of the increased leverage available in options (or those who aren’t interested in owning the stock longer term) may see a benefit in buying STZ options instead of stock. Traders who buy calls, for example, limit their maximum loss to the cost of the options and, unlike stock traders, won’t get stopped out of a position in the event of a brief, but sharp adverse move in STZ shares. Stock traders would likely want to see the stock rebound quickly after any test of the recent low. Today’s numbers (all times ET): Producer Price Index (PPI), 8:30 a.m. UK parliament vote on Brexit scheduled. Today’s earnings include: First Republic Bank (FRC), IHS Markit (INFO), JPMorgan Chase (JPM), Synovus (SNV), UnitedHealth (UNH), Wells Fargo (WFC). 1 CNBC.com. Constellation Brands stock sinks as weak wine sales, cannabis investment hurt 2019 forecast. 1/9/19. 2 Barron’s. Constellation Brands Stock Jumps on More Upgrades. 1/10/19. 3 CNBC.com. Top pot analyst says Corona maker Constellation is a best stock idea for 2019. 12/10/18. 4 StreetInsider.com. Constellation Brands (STZ) Should Recover As Beer Story Becomes Better Understood–Morgan Stanley. 1/11/19. Will going small pay off big?